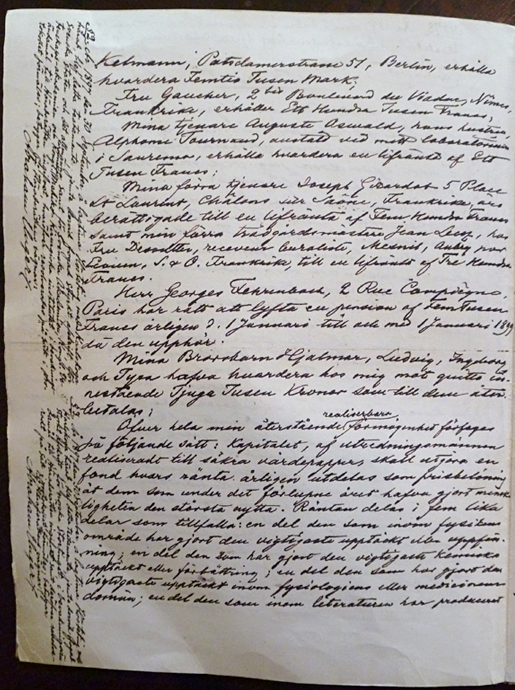 Mrs Sofie Kapy von Kapivar, whose address is known to the Anglo-Oesterreichische Bank in Vienna, is entitled to an annuity of 6000 florins Ö.W. which will be paid to her by the aforementioned bank, and to this end I have deposited in this bank the amount of 150 000 florins in Hungarian sovereign bonds. My former servant, Joseph Girardot, of 5 Place St. Laurent, Châlons sur Saône, France, is entitled to an annuity of five hundred francs, and my former gardener, Jean Lecof, residing with Mrs Desoutter, receveur Curaliste, Mesnil, Aubry pour Ecouen, S.& O., France, will receive an annuity of three hundred francs. Mr Georges Fehrenbach, of 2 Rue Compiègne, Paris, is entitled to collect an annual pension of five thousand francs from 1 January  to 1 January 1899, when it will cease. All of my remaining realisable assets are to be disbursed as follows: the capital, converted to safe securities by my executors, is to constitute a fund, the interest on which is to be distributed annually as prizes to those who, during the preceding year, have conferred the greatest benefit to humankind. The interest is to be divided into five equal parts and distributed as follows: one part to the person who made the most important discovery or invention in the field of physics; one part to the person who made the most important chemical discovery or improvement; one part to the person who made the most important discovery within the domain of physiology or medicine; one part to the person who, in the field of literature, produced the most outstanding work in an idealistic direction; and one part to the person who has done the most or best to advance fellowship among nations, the abolition or reduction of standing armies, and the establishment and promotion of peace congresses. The prizes for physics and chemistry are to be awarded by the Swedish Academy of Sciences; that for physiological or medical achievements by the Karolinska Institute in Stockholm; that for literature by the Academy in Stockholm; and that for champions of peace by a committee of five persons to be selected by the Norwegian Storting. It is my express wish that when awarding the prizes, no consideration be given to nationality, but that the prize be awarded to the worthiest person, whether or not they are Scandinavian. My assets currently consist partly of real estate in Paris and San Remo, and partly of securities deposited with the Union Bank of Scotland Ltd in Glasgow and London, with Crédit Lyonnais, Comptoir National d’Escompte, and with Alphen, Messin & Co. in Paris; with stockbroker M.V. Peter of Banque Transatlantique, also in Paris; with the Direction der Disconto Gesellschaft and with Joseph Goldschmidt & Cie in Berlin; with the Russian Central Bank, and with Mr Emmanuel Nobel in Petersburg; with Skandinaviska Kreditaktiebolaget in Gothenburg and Stockholm, with Enskilda Banken in Stockholm and in my strong box at 59 Avenue Malakoff, Paris; as well as of accounts receivable, patents, patent fees or royalties due to me, etc. about which my executors will find information in my papers and books. As of now, this will and testament is the only one that is valid, and revokes all my previous testamentary dispositions, should any such be found after my death. Finally, it is my express wish that following my death, my arteries be severed, and when this has been done and competent doctors have confirmed clear signs of death, my remains be incinerated in a crematorium. 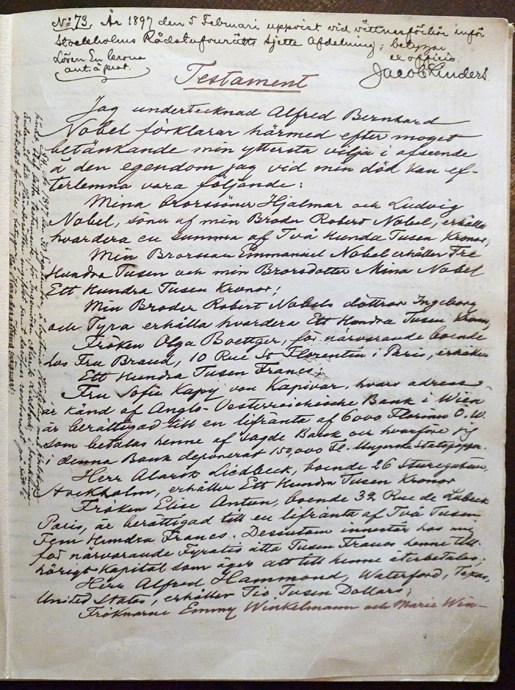 The first page of Alfred Nobel's will, dated 27 November, 1895. 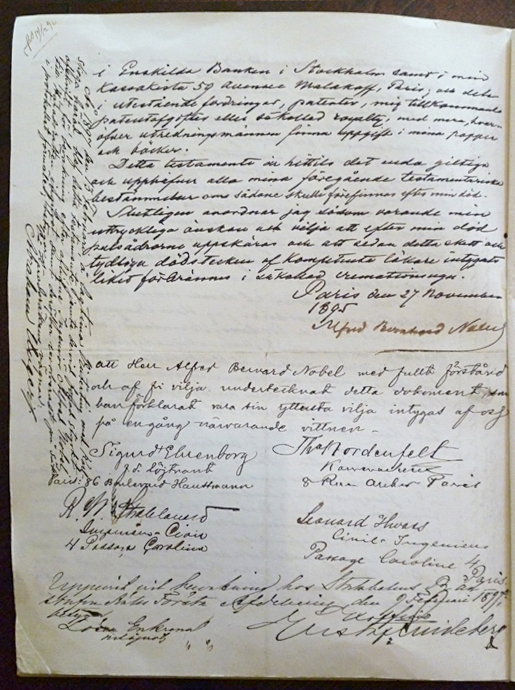 The second page of Alfred Nobel's will. 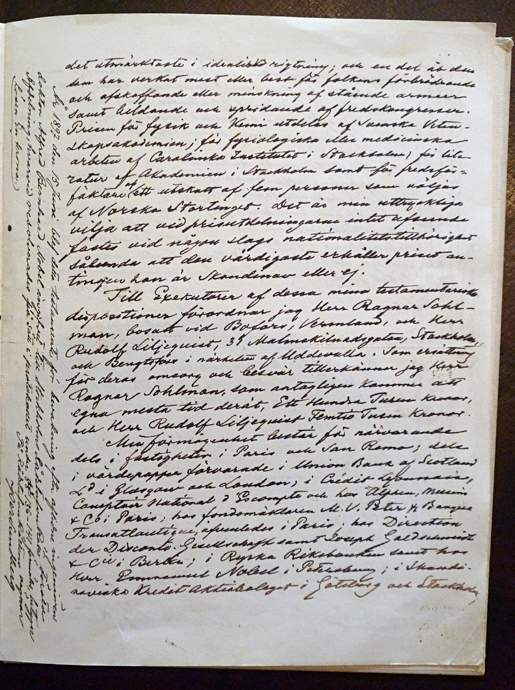 The third page of Alfred Nobel's will. The fourth and last page of Alfred Nobel's will.